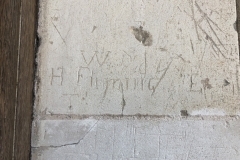 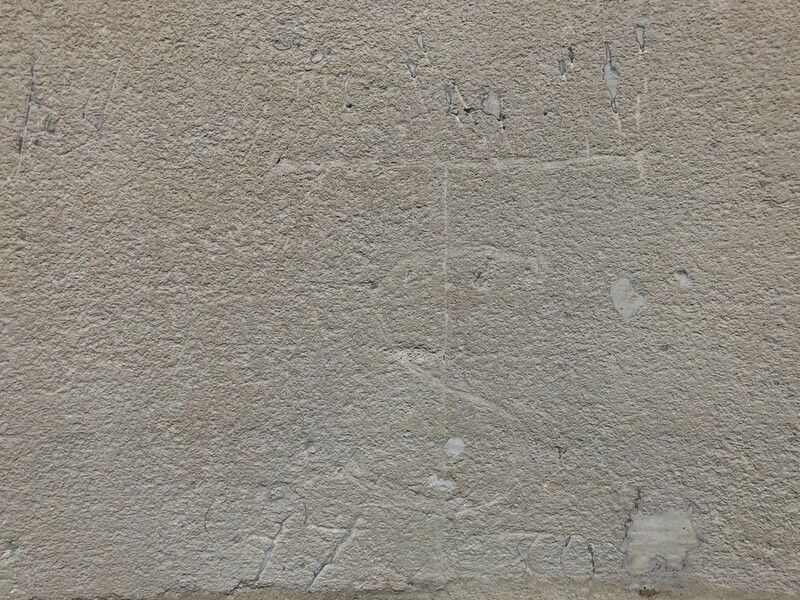 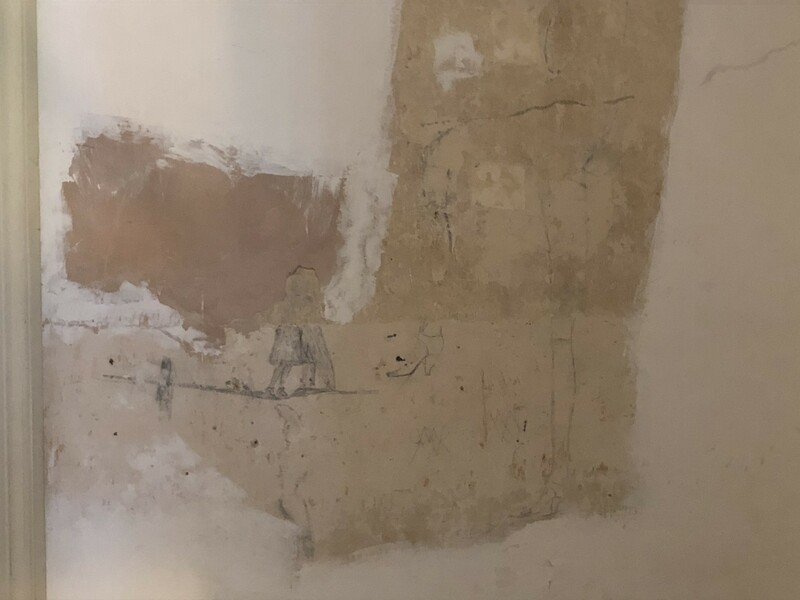 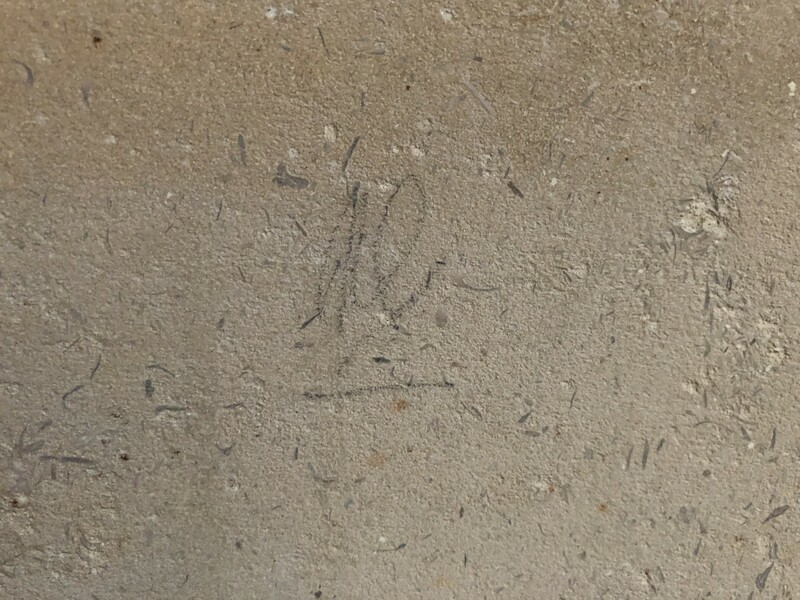 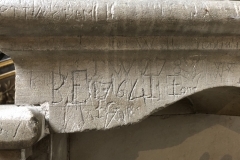 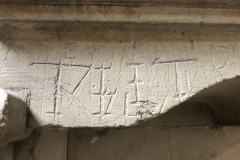 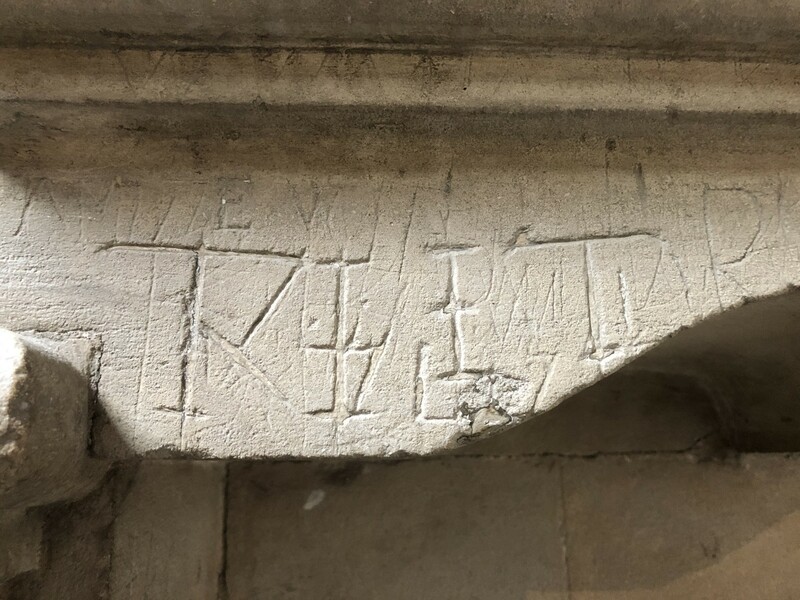 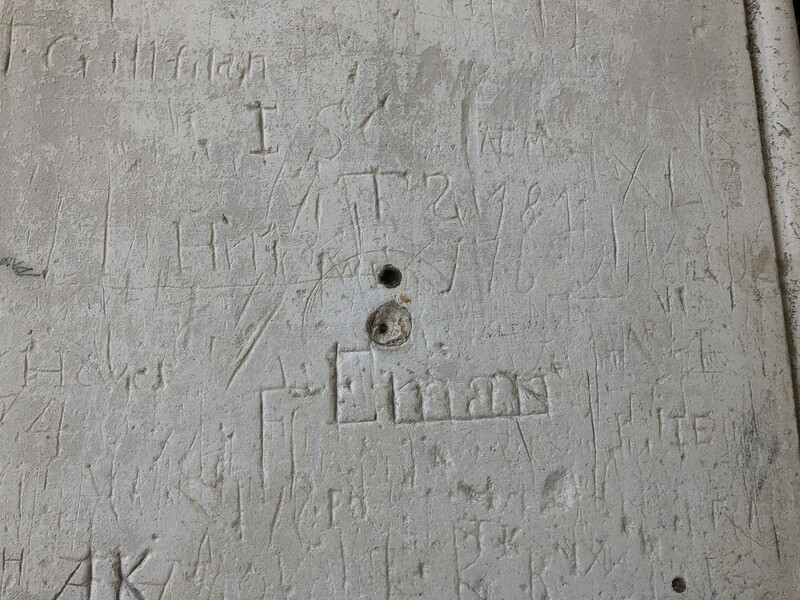 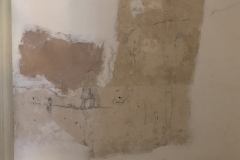 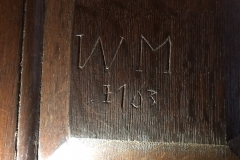 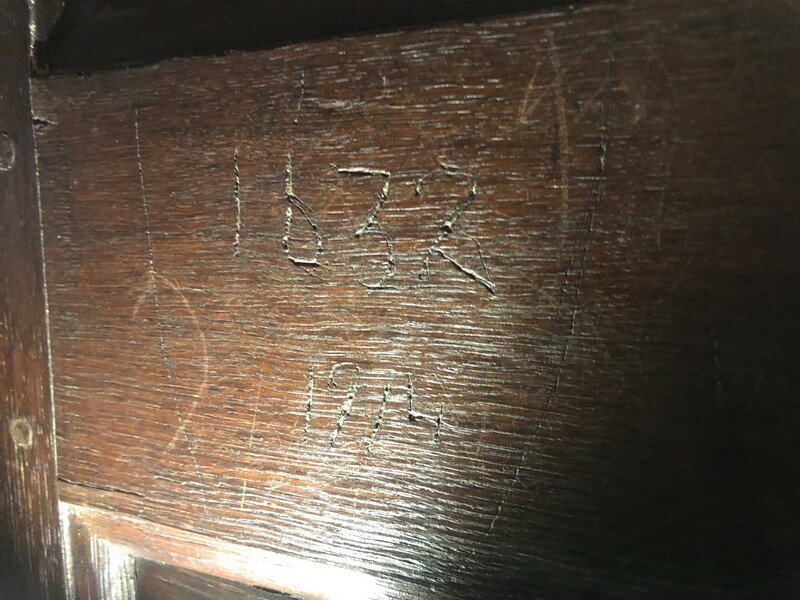 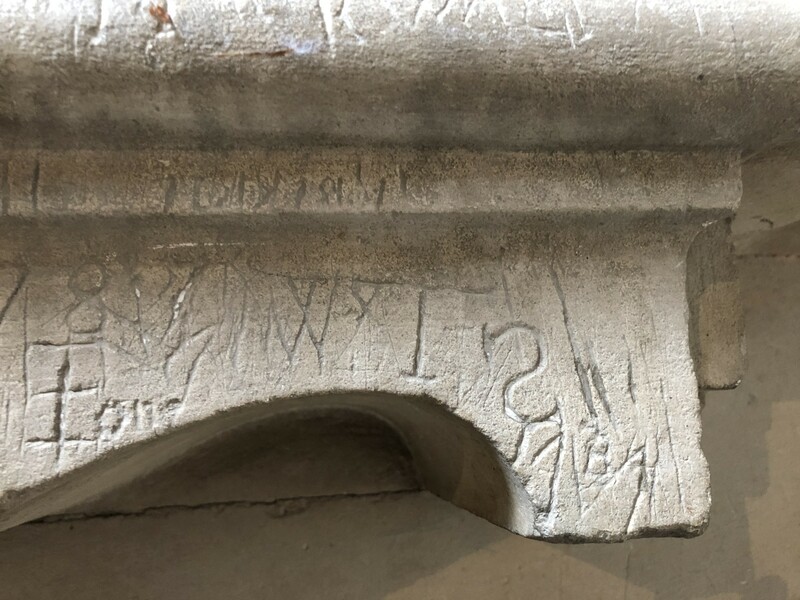 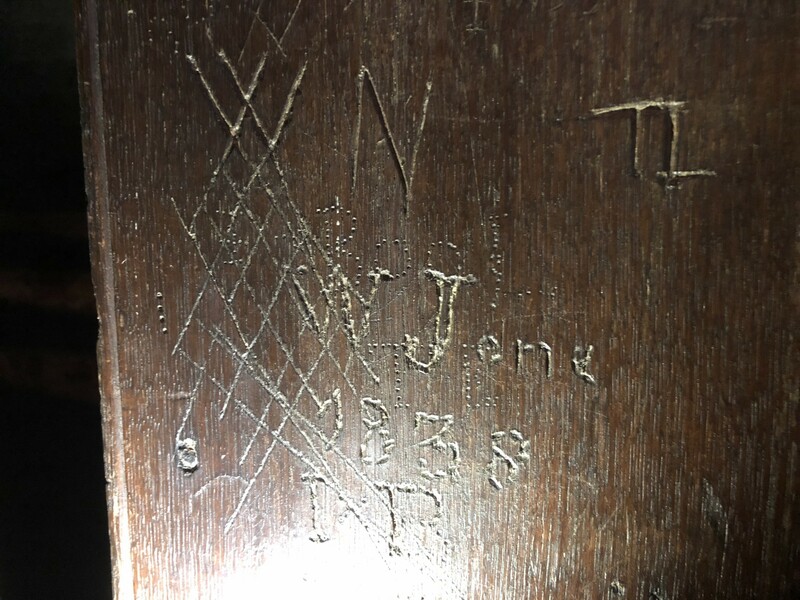 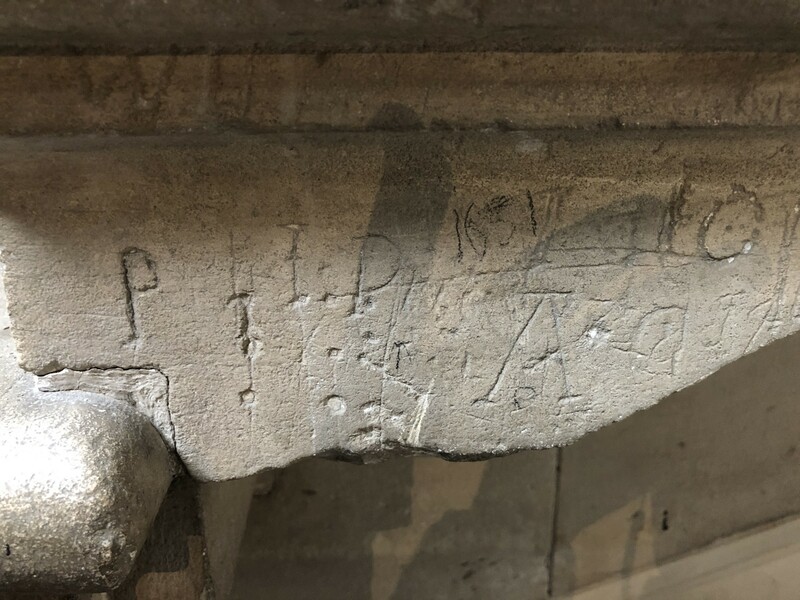 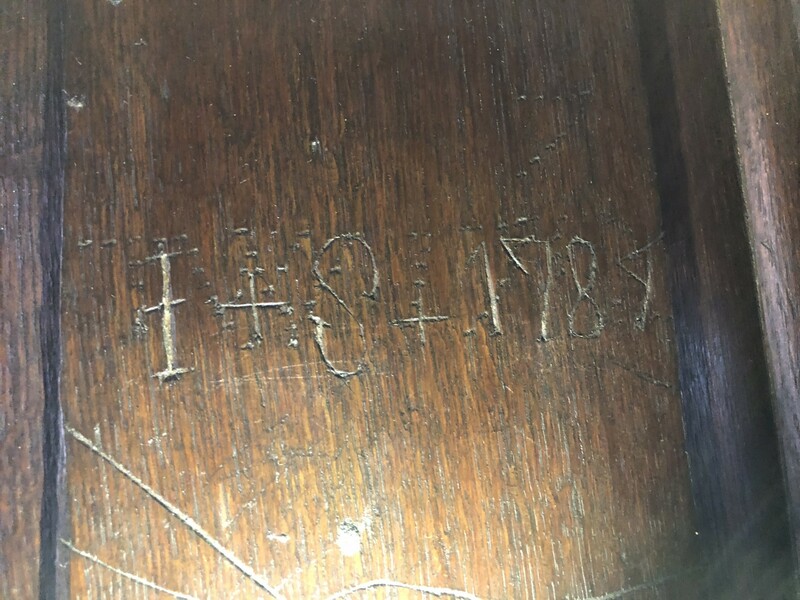 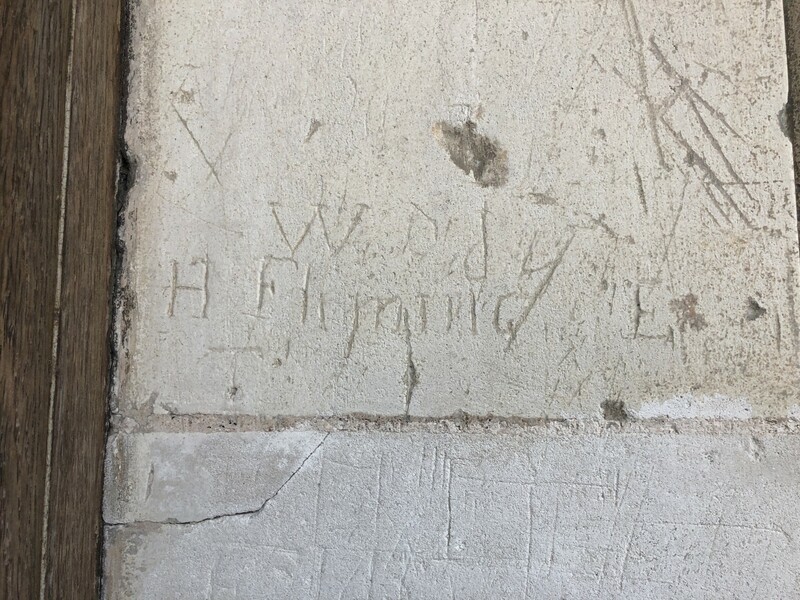 The previous post on Hampton Court dealt with graffiti in the Tudor areas of the palace. 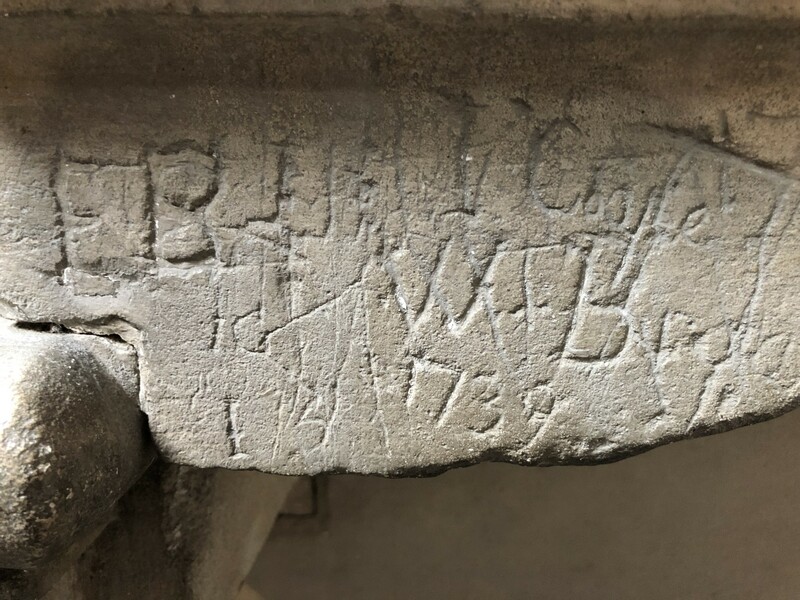 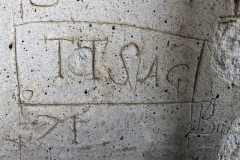 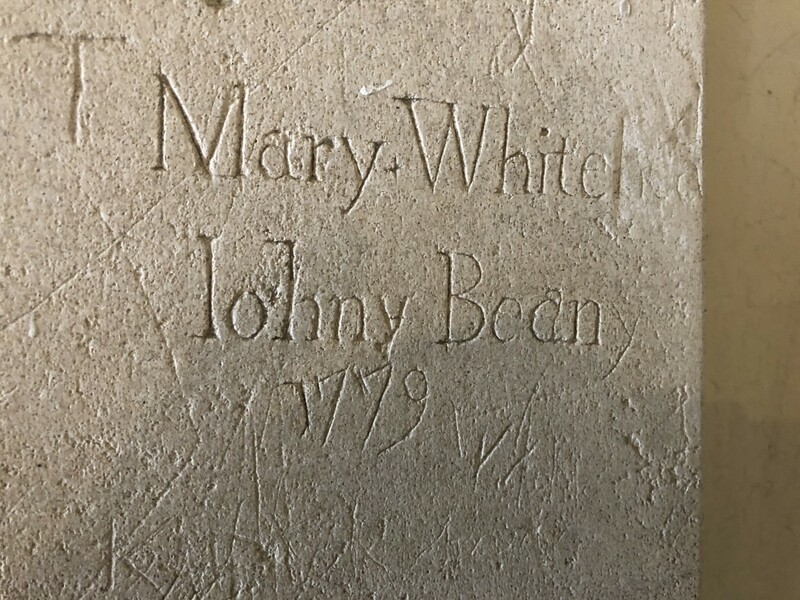 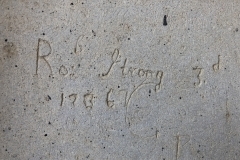 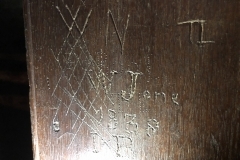 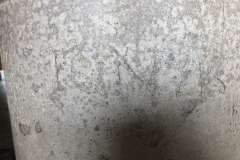 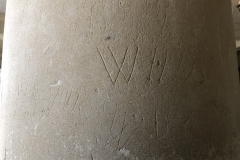 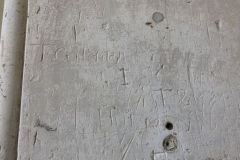 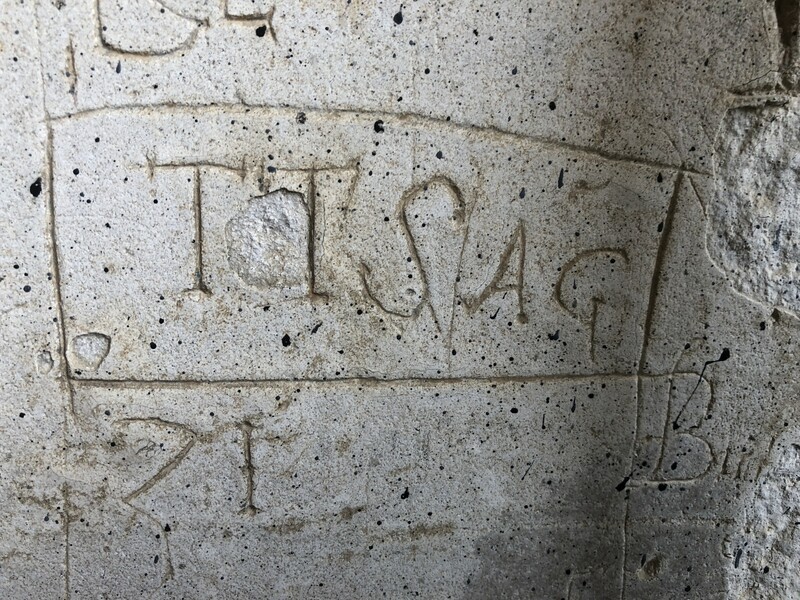 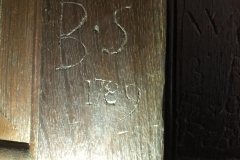 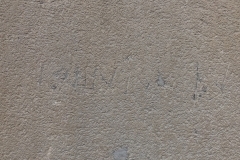 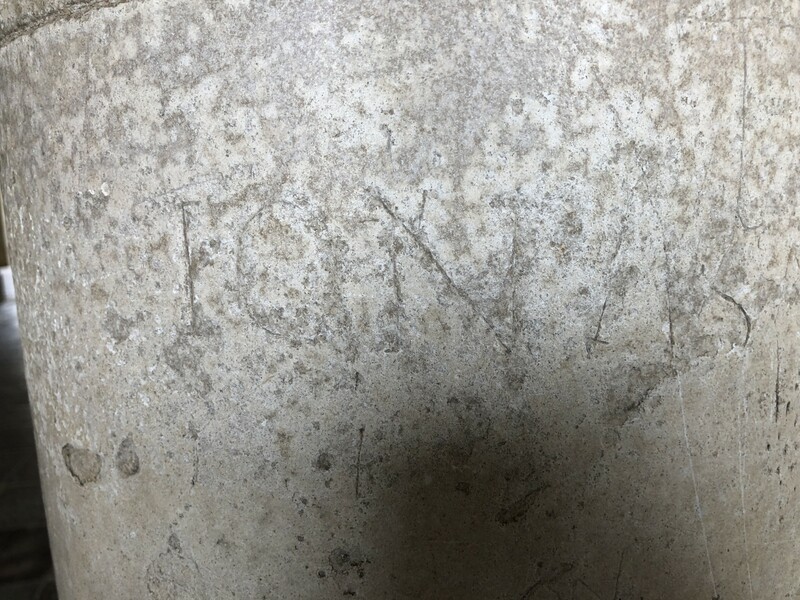 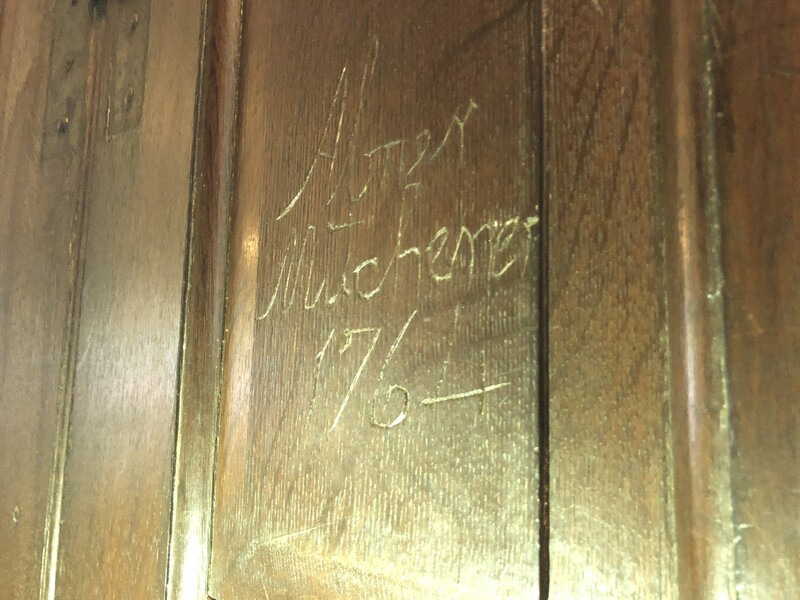 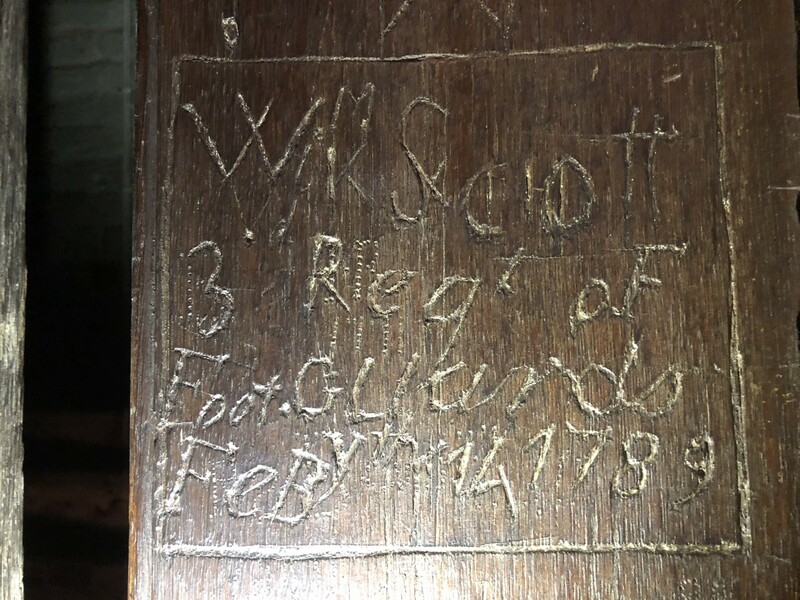 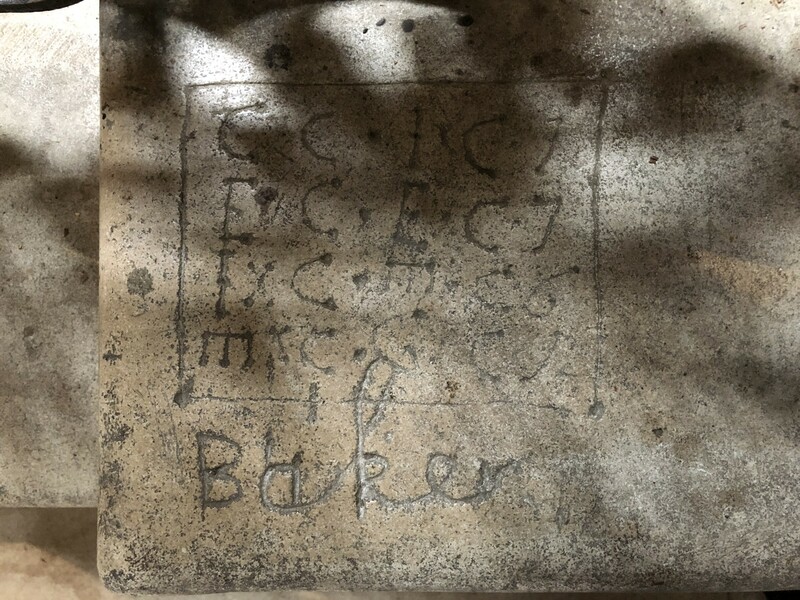 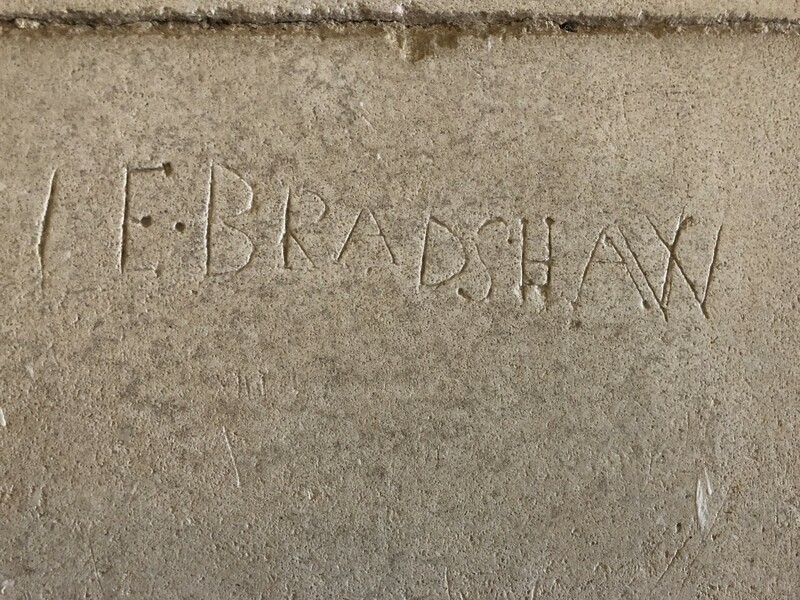 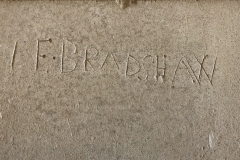 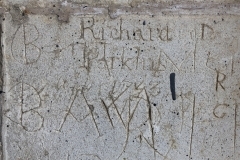 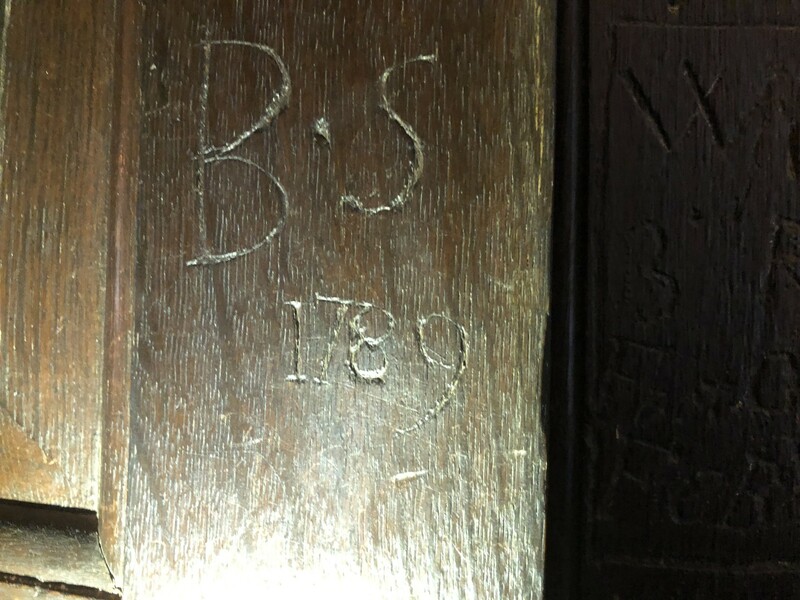 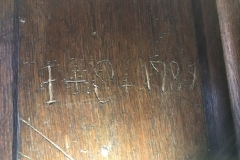 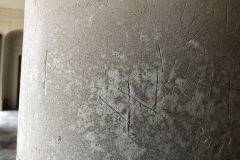 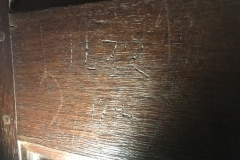 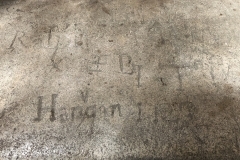 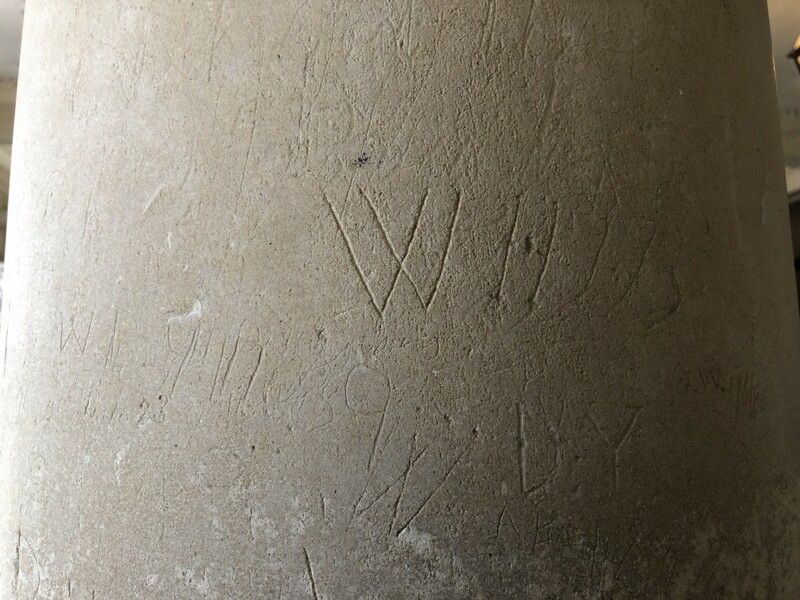 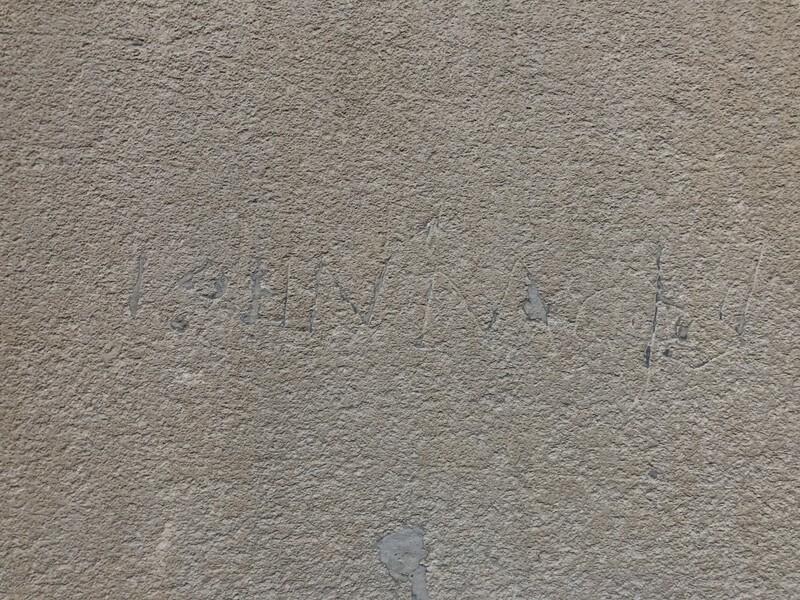 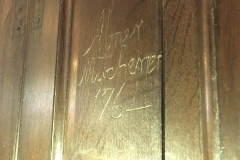 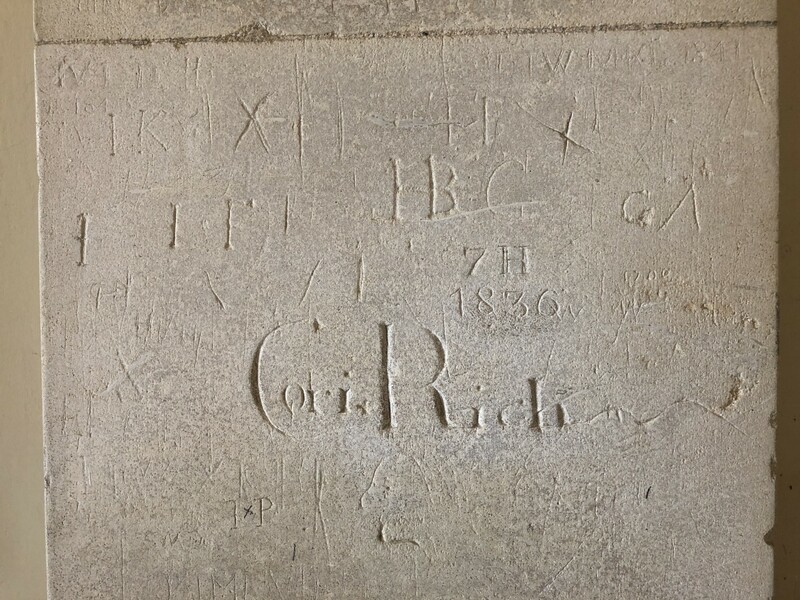 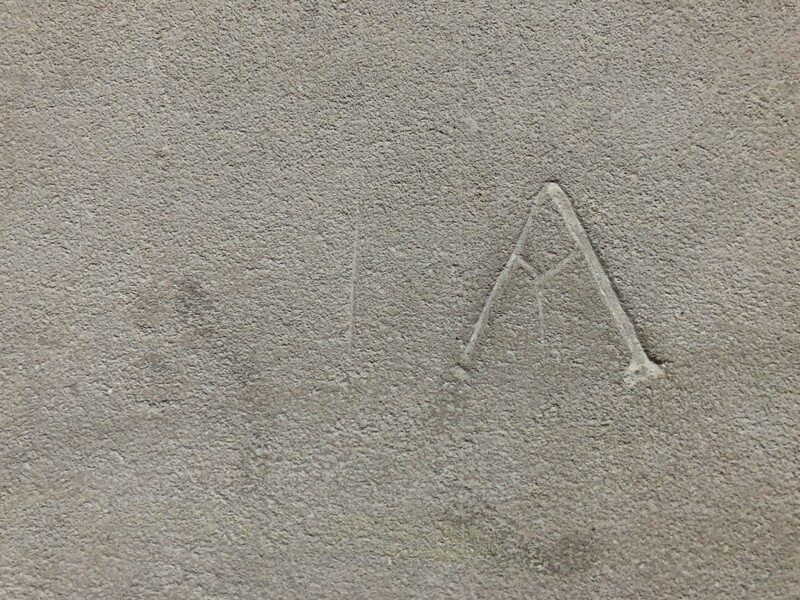 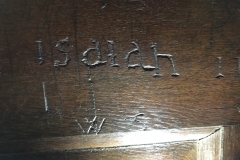 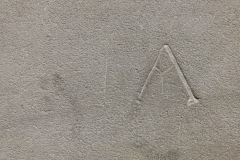 The 17th century areas of the building have their own graffiti too. 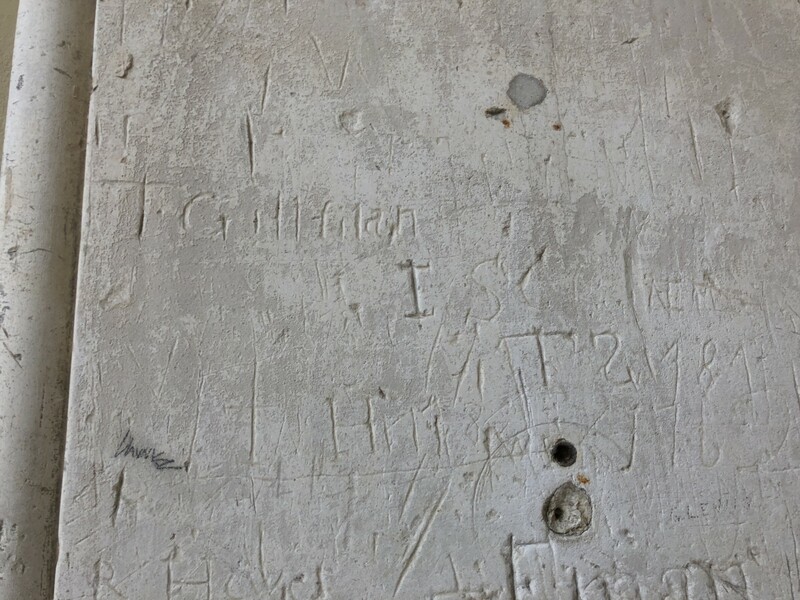 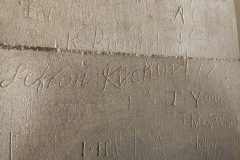 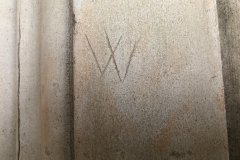 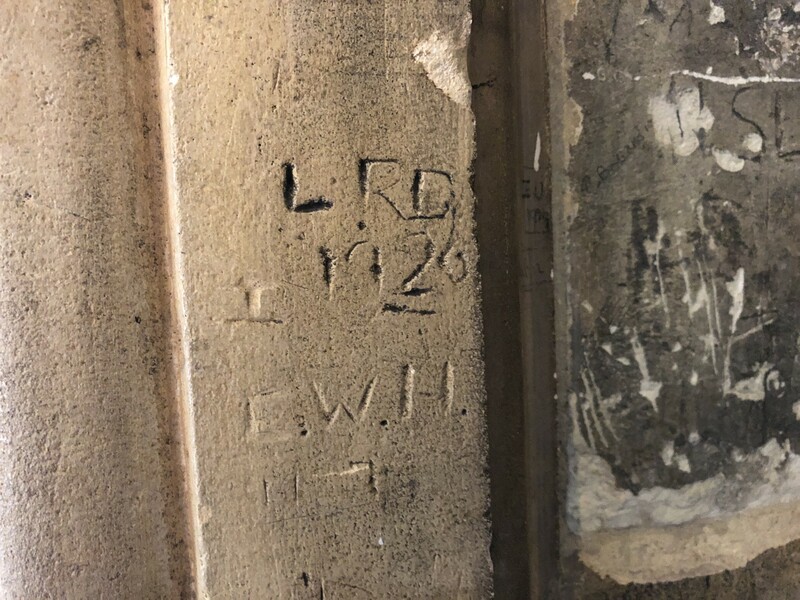 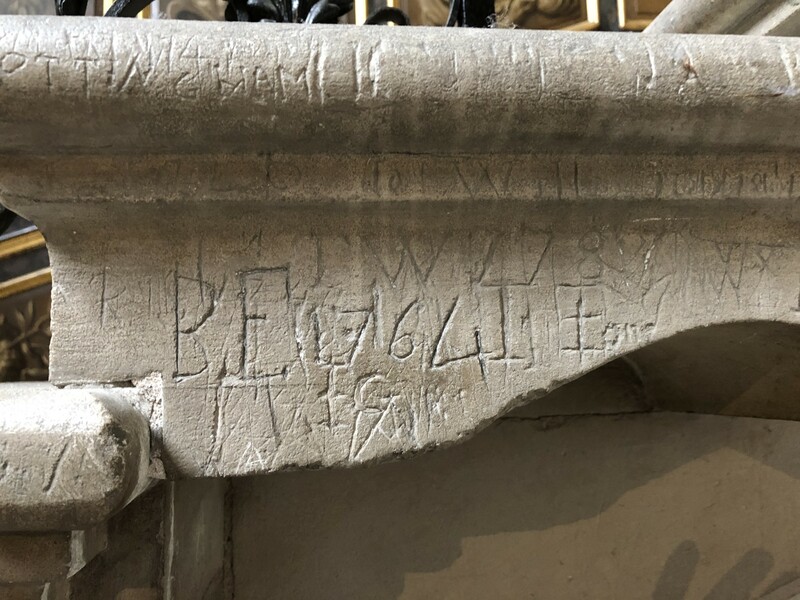 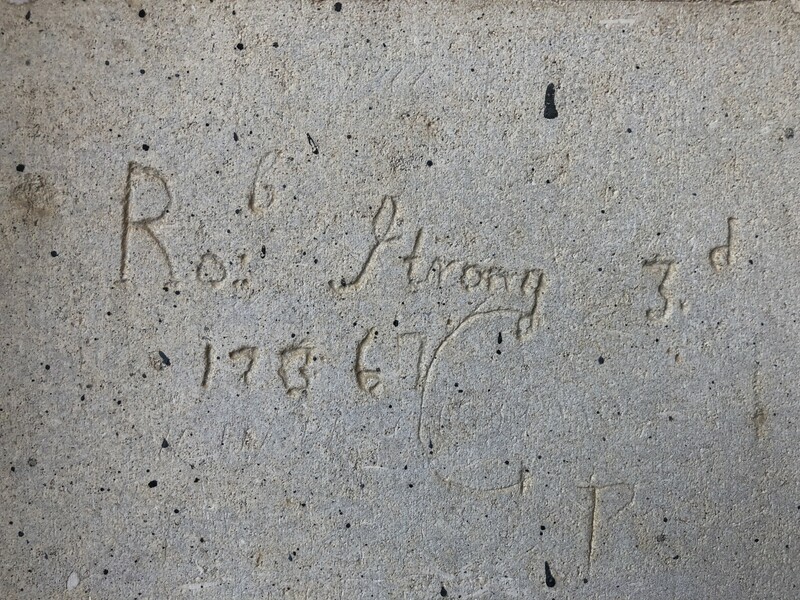 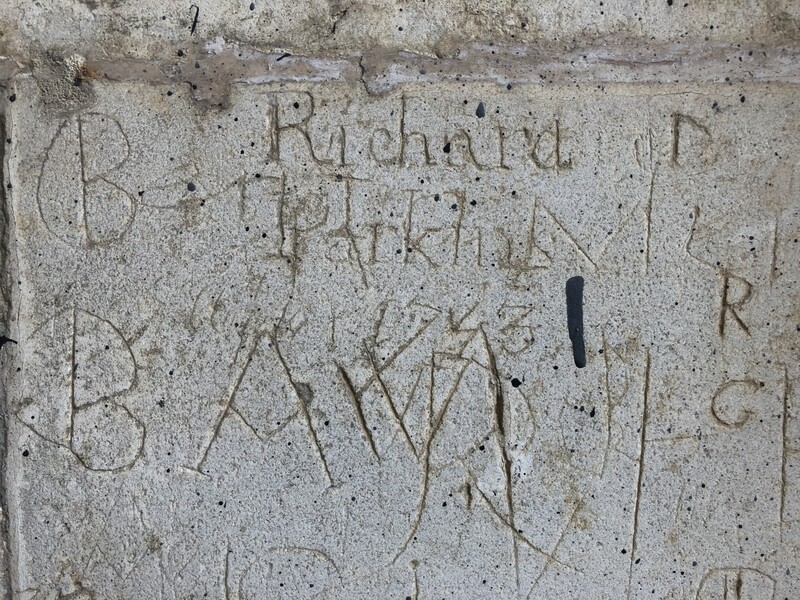 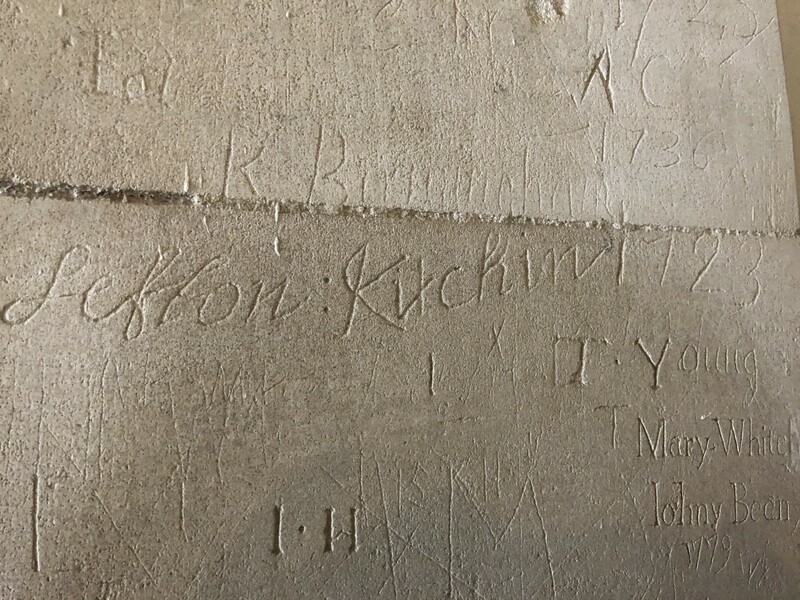 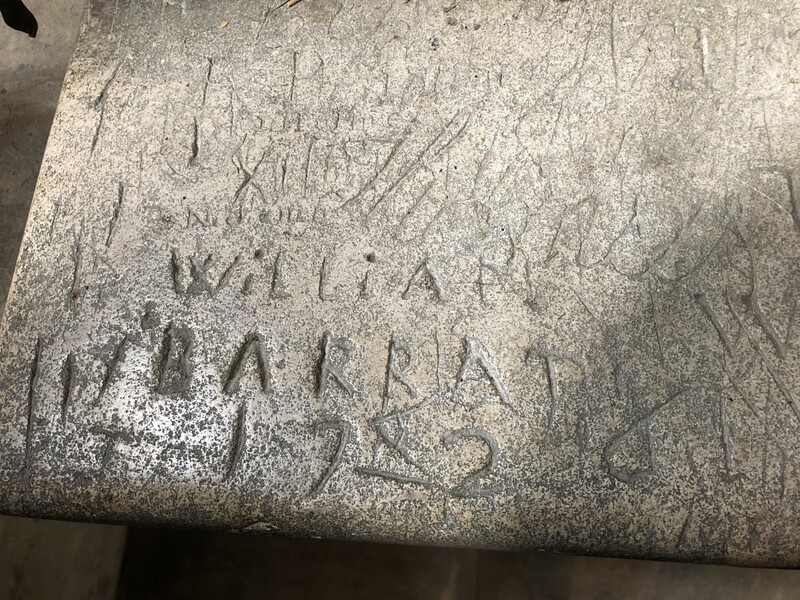 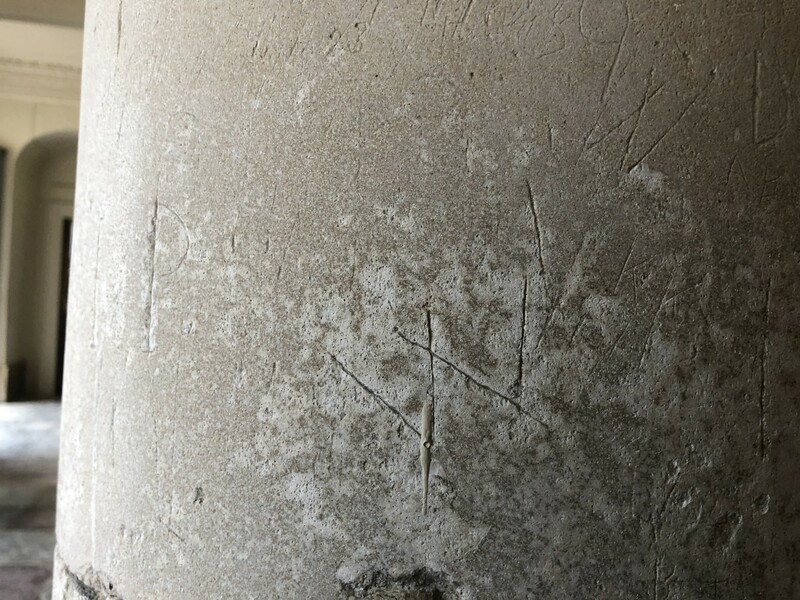 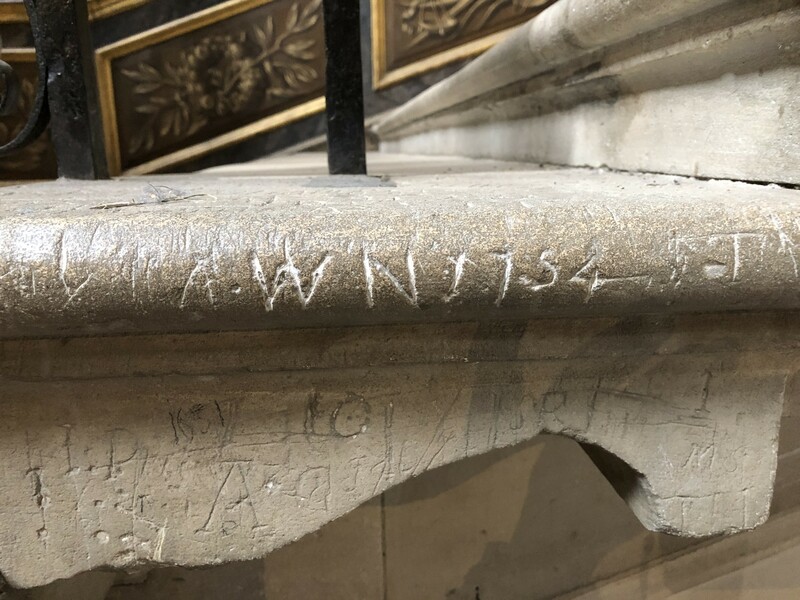 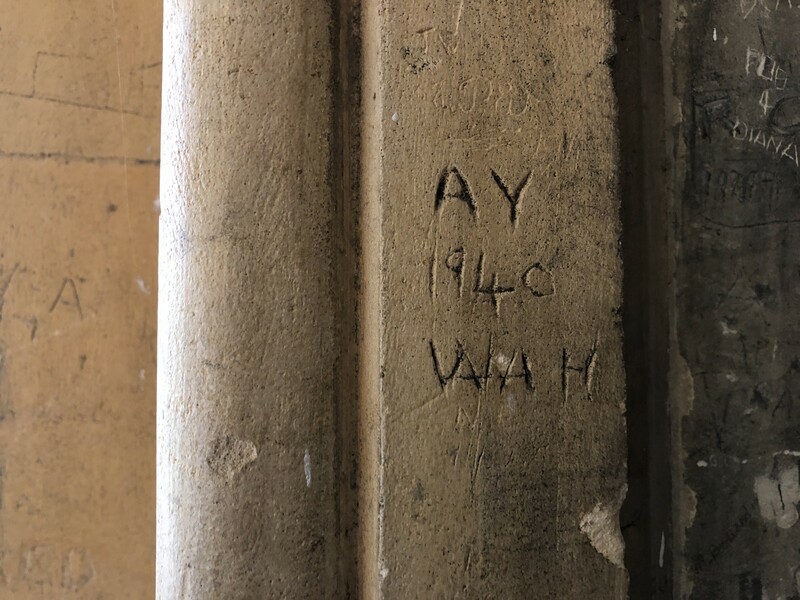 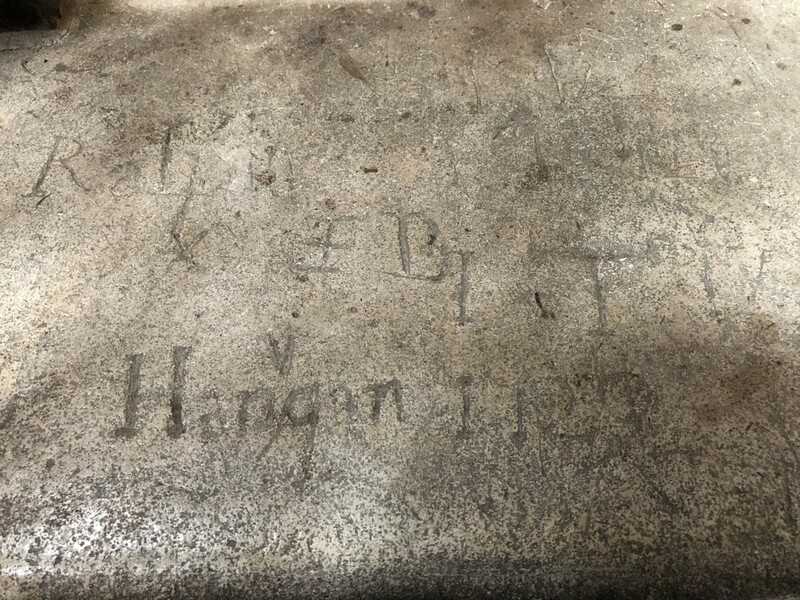 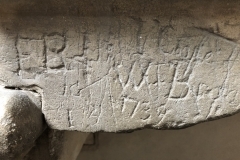 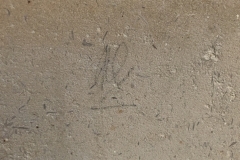 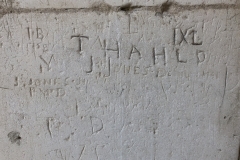 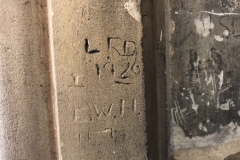 Most of the graffiti is concentrated in two areas – The Kings Staircase entrance from the Clock Court and the East Front entrance from the East Front Gardens. 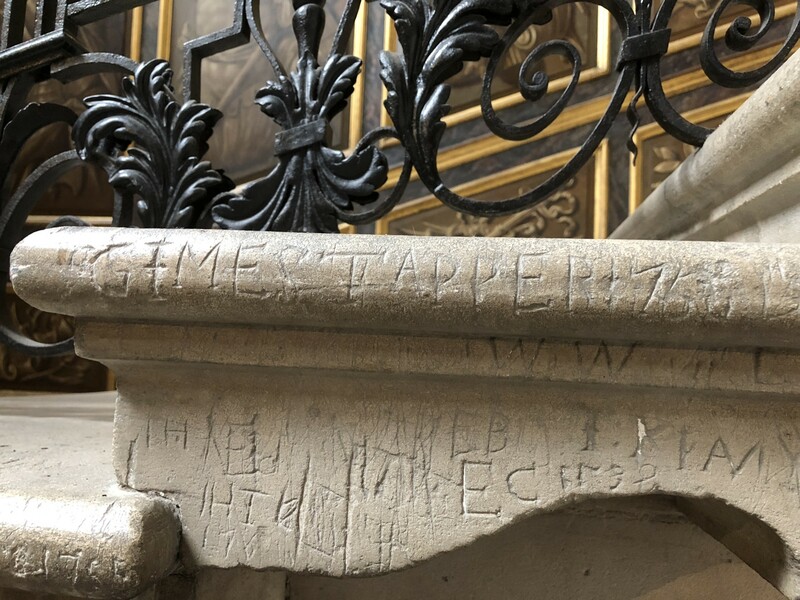 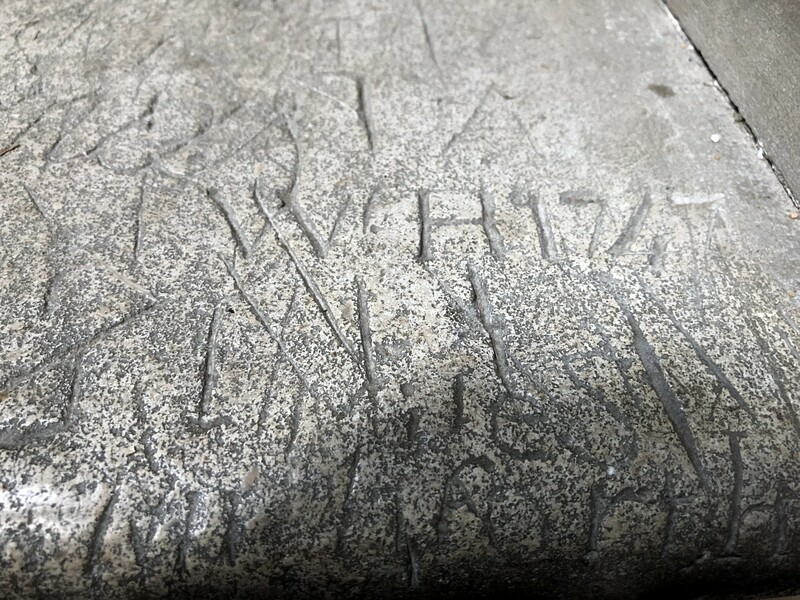 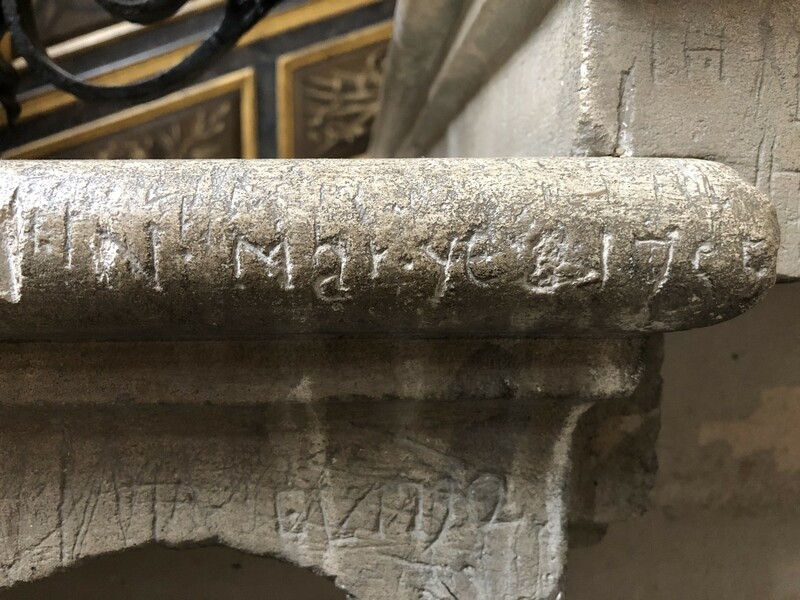 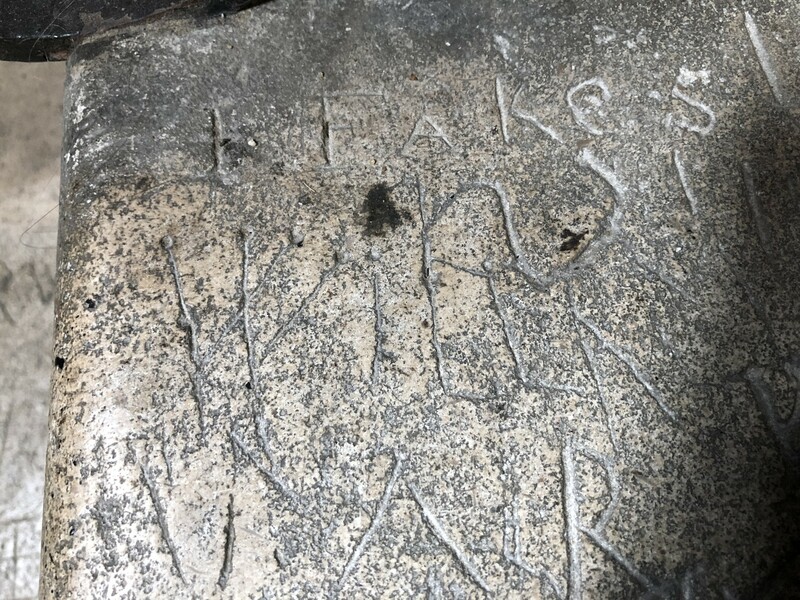 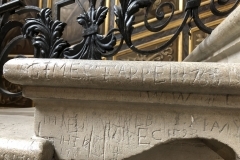 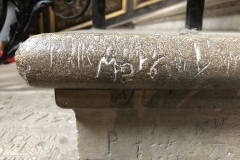 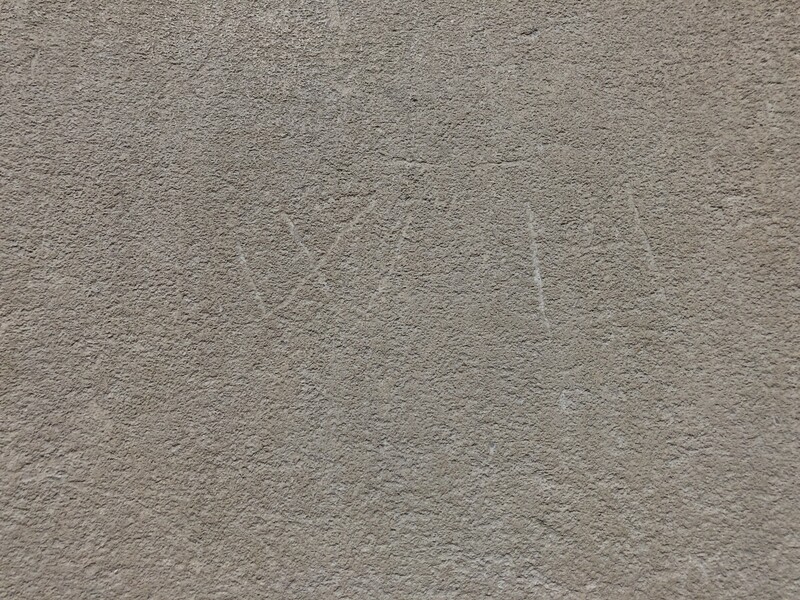 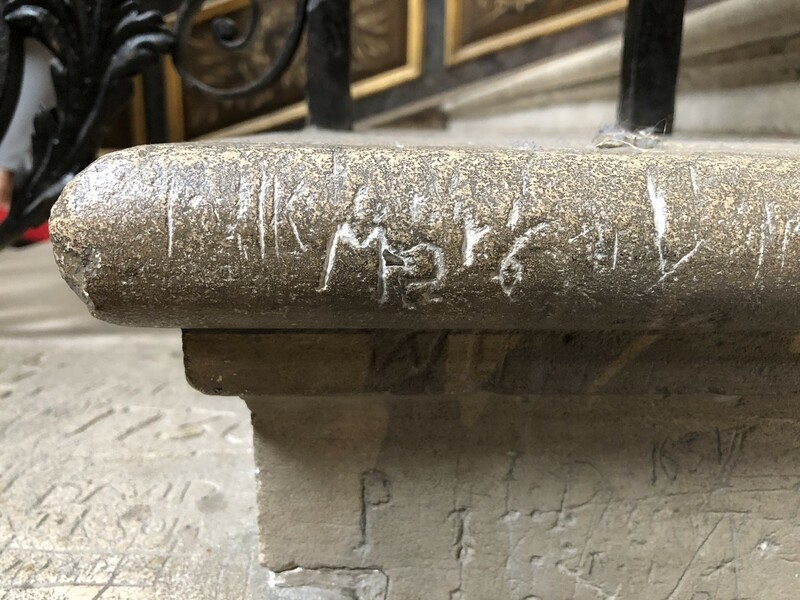 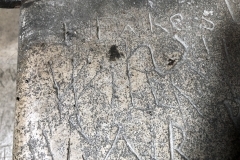 The Kings Staircase entrance has a fine shoe scratched on one wall and a host of initials and names mostly engraved on the stairs themselves. 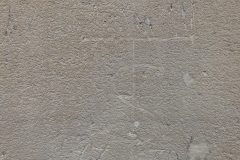 The shoe could almost be one of the earlier British examples on this page of 18th Century Shoes. 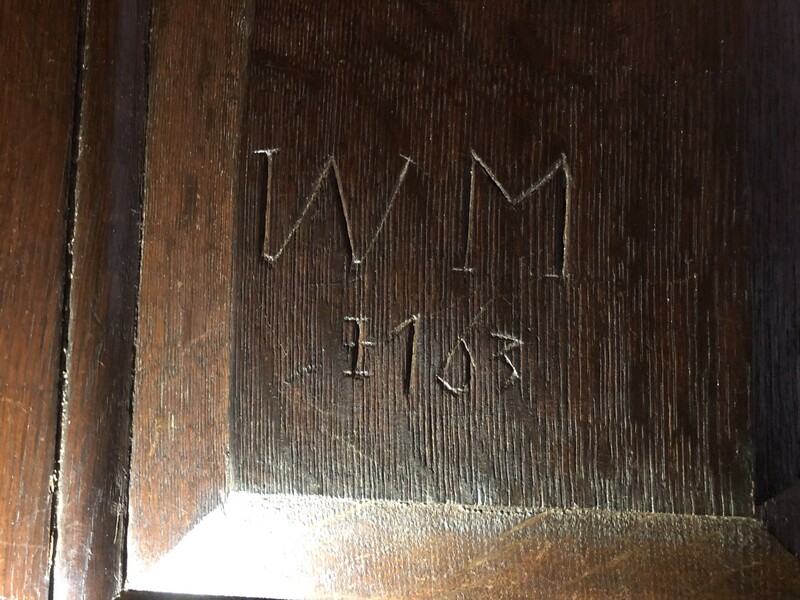 The wooden doors to the staircase from one of the corridors has several names one, at least, must have been a member of the king’s guards. 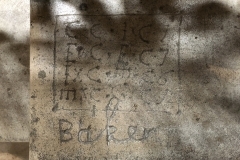 The Fountain Court cloisters lead to the Chocolate Kitchens where a couple of drawings are visible, unfortunately behind a barrier so the photo is not a close-up. 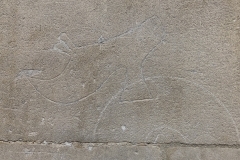 There are the bottom half of two figures. 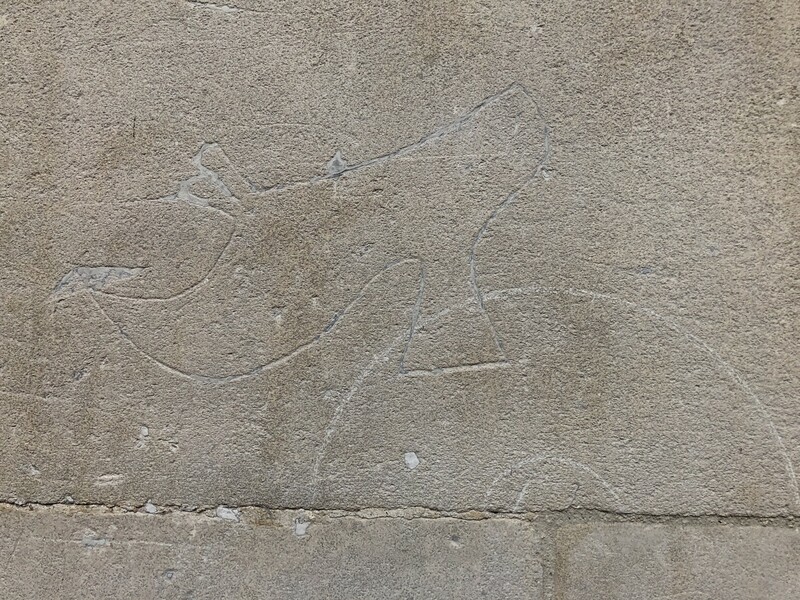 And a fine pair of long legs with one foot resting on a step or something. 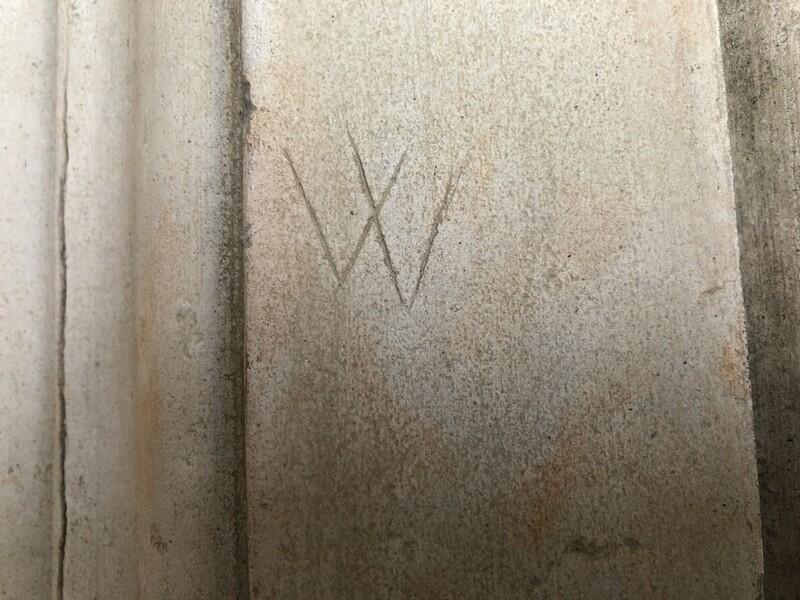 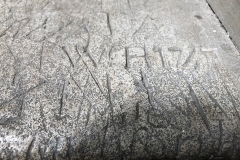 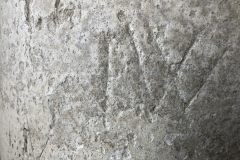 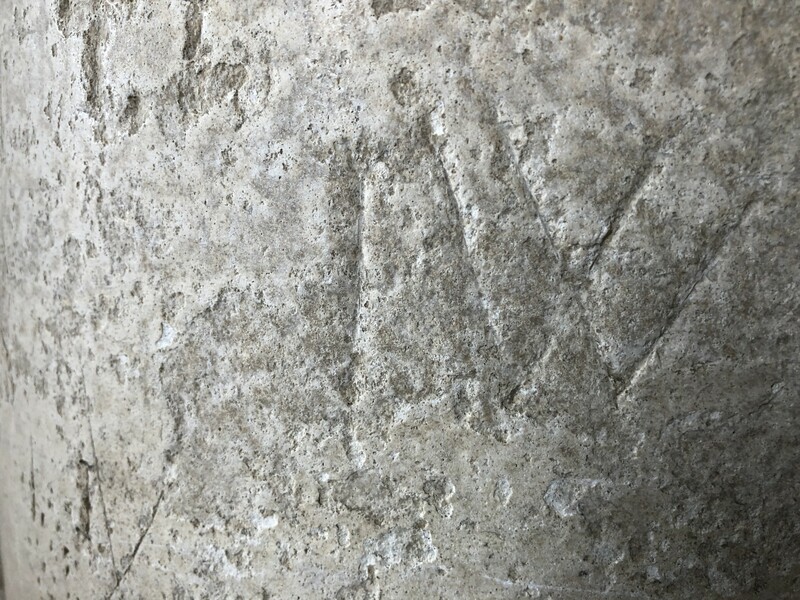 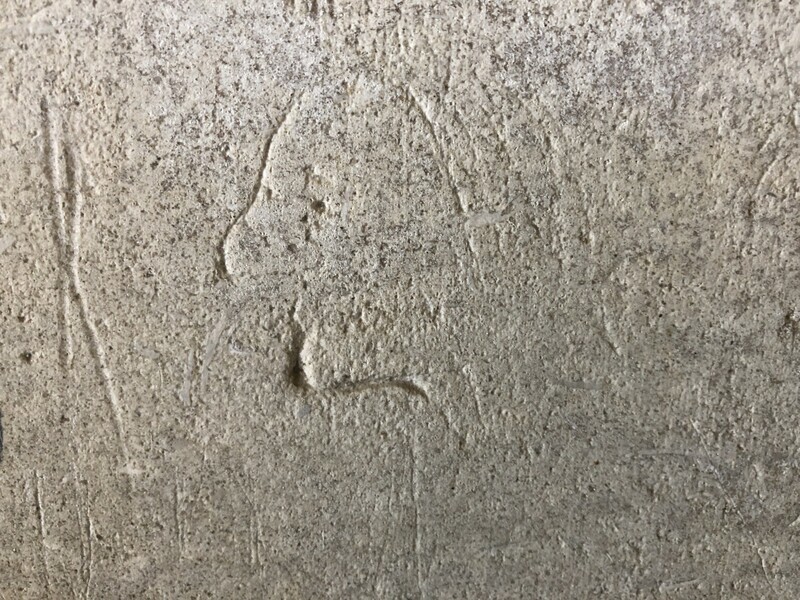 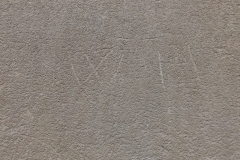 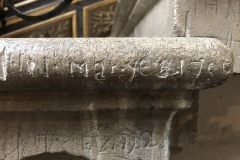 The East Front entrance has several tourist graffiti or possible servant graffiti with a couple of possible Marian mark Ws among them. 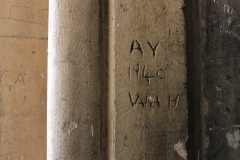 One of the names on the columns in the East Front entrance attracted my attention. 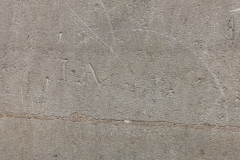 A person with the individual name of Coriolanus Rich. 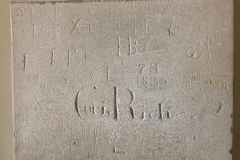 He appears twice, once as Coriolanus Rich and once as Cori Rich. 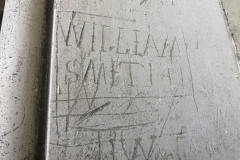 I felt that such a name should not go unresearched and was very pleased to find that he appears in print. 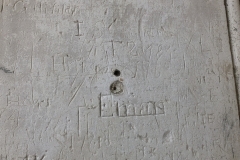 In the book, British Naval Captains of the Seven Years’ War: The View from the Quarterdeck A. 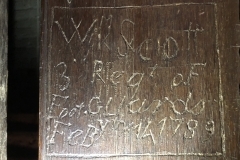 B. McLeod quotes a Captain Medows who was having problems with a master at arms: “Some men were incorrigible deserters. 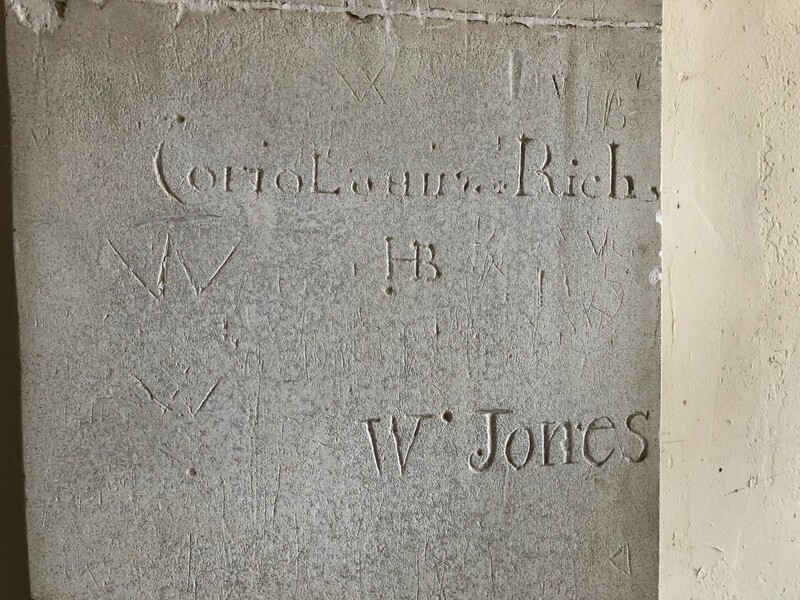 The 24-year-old Coriolanus Rich, Charles Medows’s master at arms, had deserted, been retaken, escaped from confinement and ‘has got quite off notwithstanding all the means I have used to retake him'” (McLeod, AB. 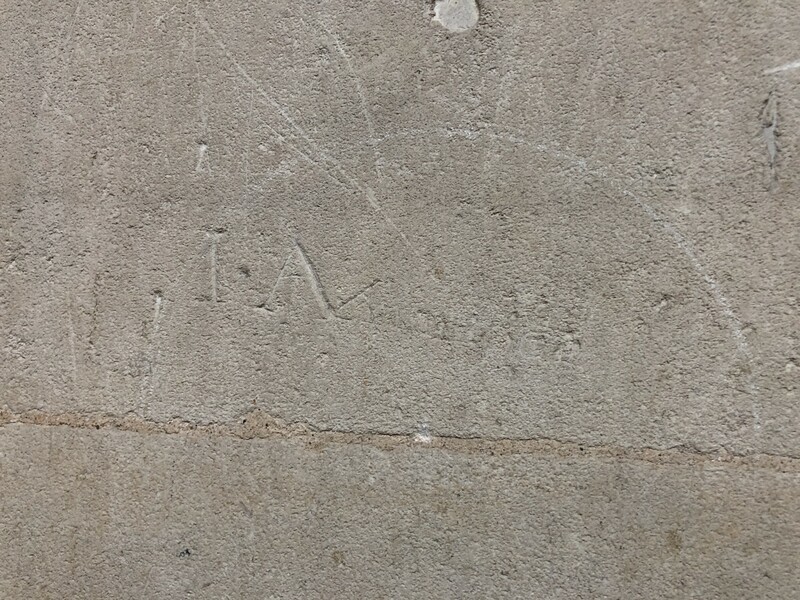 British Naval Captains of the Seven Years’ War: The View from the Quarterdeck, London, 2012). 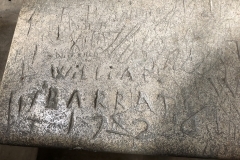 This was in 1758. 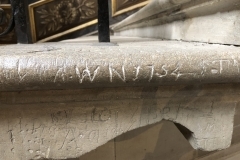 Raking Light’s friendly genealogist, Richard Rossington, found that in 1766, a Coriolanus Rich wasin trouble at the Old Bailey, for stealing boots in St Martin in the Fields Parish. 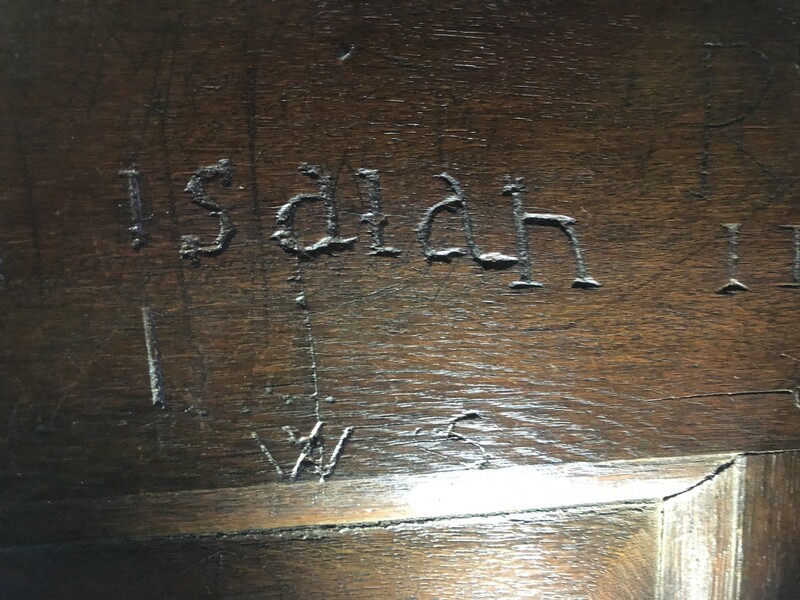 There is a word under his name that probably says ‘escaped’. 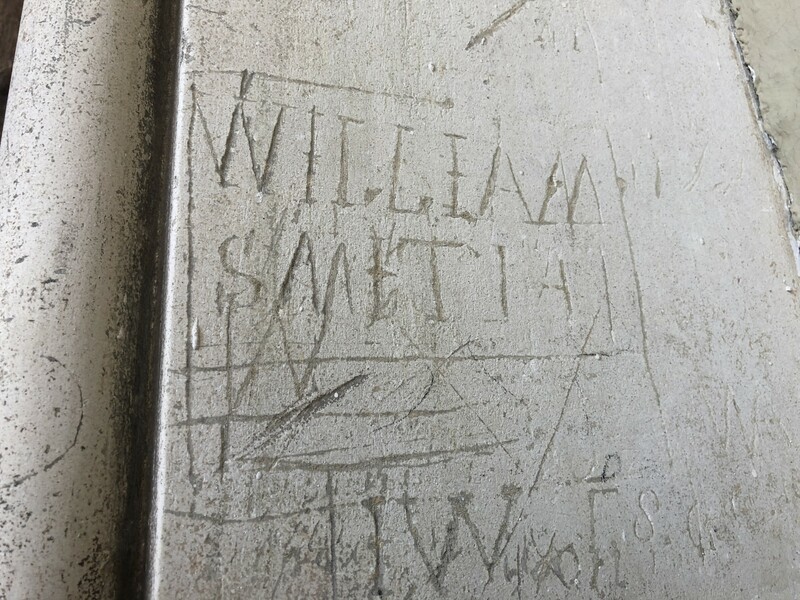 Somehow this doesn’t seem all that surprising seeing his previous history with His Majesty’s Navy. 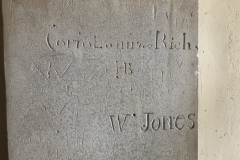 That’s it for Coriolanus Rich, although a Cariolanus Rich shows up in the 1790 census for Flatbrush, Kings County, New York. 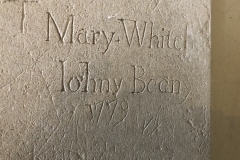 He is described as a ‘Free White Male’ married to a ‘Free White Female’, but gives his birth as New York State 1750. 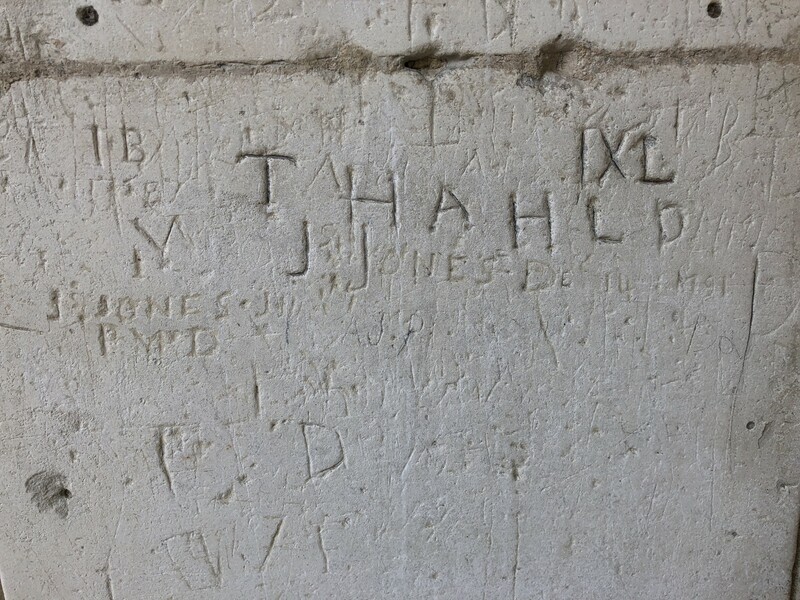 There is no way of knowing if this is the same man who declined to serve in the Royal Navy, escaped from the Old Bailey and wrote his name on Hampton Court but it would be nice to think he slightly adjusted his identity to make a new start in a new world. 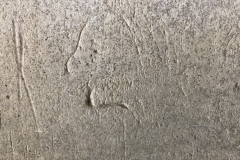 See website for opening times and prices.